Glee : a TV show that exists. 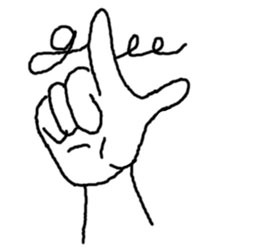 A Glee “loser hand” drawn with a mouse in approx. 5 seconds. Because I could not be bothered to make proper Glee fanart. Glee is a TV show that exists. It is very famous and has a huge fan following. It is horrible except when it’s awesome and awesome except when it’s horrible. Sometimes it verges into middle-of-the-road-okay territory, but those times are rare. Rare like unicorns, except that in Glee , everyone is apparently a rare and special unicorn, so maybe something rarer than that. The mythical bisexual man, perhaps, the existence of which Glee attempted to debunk in “Blame it on the Alcohol” (Season 2, Episode 14). So yeah, in the Glee universe, bisexual men are totes just confused gay men going through a phase. But remember that diversity and acceptance are important, kiddos! Oh, Glee . I hate Glee except when I love it and love Glee except when I hate it. Some days, it just seems like an incredible mishmash of hypocrisy and random exploitative stereotyping, not helped by the fact that one of its most-beloved characters is one of the flimsiest straw bigots ever to grace a TV monitor. I mean, Sue Sylvester’s bigotry is not even consistent, and it changes to suit the needs of each individual episode. Of course, everyone’s everything changes to suit the needs of each individual episode, and relationships between characters may as well be dictated by musical chairs. What I’m saying is, some days, I’m ashamed I ever watch Glee . I go through weeks where the thought of watching it just makes me feel bad about myself. And then a switch flips in my brain or something, and my feeling of “wouldn’t touch it with a ten foot pole” becomes “needs want must have now” and I marathon whatever’s up on Hulu until I’m more-or-less current again. And it’s not that there’s no good to be had there. The cast is amazingly talented (at times so much more so than the material merits that there’s kind of a weird disconnect) and there are some really cool, breakout, takeaway performances. Darren Criss and guest star Matt Bomer singing Gotye’s “Somebody That I Used to Know” in “Big Brother” (Season 3, Episode 15)? Awesome. The cover of No Doubt’s “Don’t Speak” in “The Break Up” (Season 4, Episode 4)? It got some mixed reviews, but it’s one of my favorite numbers in the show. Heck, all of “The Break Up”? That episode was just really well done. Lea Michele singing just about anything ever, because she really is at least as talented as her character is supposed to be? I loved my Spring Awakening Original Broadway Cast recording CD well before I watched Glee , and Lea Michele is all over that soundtrack. And, in spite of all the stereotypes, in spite of all the misrepresentation and flat-out negative representation, Glee is offering something that a lot of other shows aren’t offering: representation. This representation is often not sensitive or nuanced or even respectful, but some marginalized groups/people are at least made visible. Marginalized teens, at that. There aren’t a ton of high-profile TV shows out there with prominent disabled and gay teen characters, or teens of color. They recently brought a male-to-female transgender teen girl into the regular cast, and I have no idea where I can find another black, teen, trans character on TV right now. Sure, it feels kind of like Glee is filling out its diversity bingo card, but, as I often remind myself while watching Glee , the bar for diversity representation in Hollywood has been set really low. Which is not to say that marginalized teens don’t deserve better than what Glee has to offer them. Because they do. They deserve so much better. So hopefully someone will offer that to them soon. Glee . It’s a TV show that exists. I will probably keep watching it, in fits and starts, at least until something better comes along.